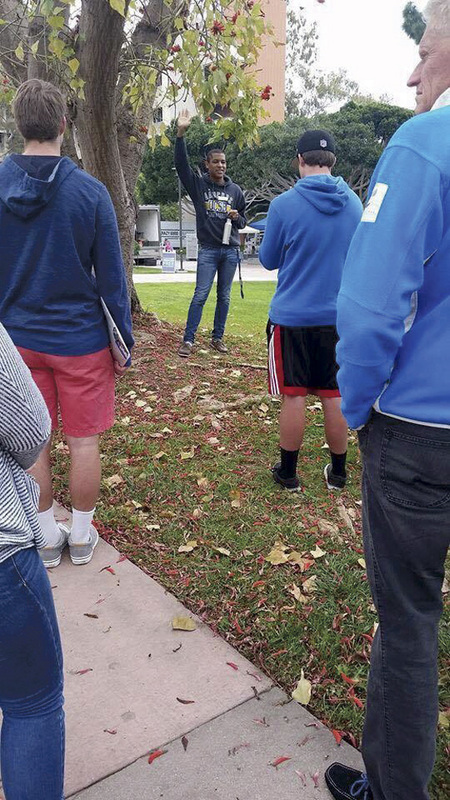 Your first visit to the University of California, Santa Barbara probably included taking a tour of our beautiful campus with a Gaucho Tour Guide. In fact, they are some of the friendliest faces on campus, giving tours to around 40,000 visitors each year. Isaiah Lee Escobar-Henry is a fourth year film & media studies and sociology double major at UCSB. He shed some light on his experience as a Gaucho Tour Guide. The following are five questions from an interview between me and Escobar-Henry. A direct transcription follows. What are some resources you always emphasize to guests that you think students should take more advantage of? I believe that students definitely underutilize the A.S. Food Bank and CAPS. Honestly, college can be expensive and difficult. And UCSB is no exception. But the A.S. Food Bank offers valuable resources in the form of free groceries, nutrition and cooking workshops, and information on how to apply for food stamps. When not thinking about finances, transitioning into a university setting also brings along a great number of other stressors. [The] number one thing that I believe students neglect is their mental health. Many students come from backgrounds where discussing mental health was never encouraged or even thought of and, as a result, they are unaware of how it can affect their daily lives and make just being a college student so much more difficult. As a result, I always highlight CAPS as a resource for students to seek help or even just learn more about themselves and gain support in doing so. How honest are you expected to be, especially with difficult topics? As tour guides, we are encouraged to be honest with our groups and give our personal experiences when it comes to difficult topics. We don’t believe in lying about UCSB especially when our work can be the very deciding factor on someone choosing to attend our university. Of course, while maintaining this expectation of honesty, we also work on being able to put a positive spin on certain topics or answers to questions we are asked. How much autonomy do you have with giving tours? Is there a standard script and route you must adhere to, or are tour guides encouraged to add personal knowledge and experience? Although we have a structured route and guide that we generally follow in order to provide consistency for our guests, we are still expected to add our own personal experiences, knowledge, and flare to our tours. We don’t believe in reading from a script or spouting out countless statistics. We believe in telling a story about UCSB and how UCSB has impacted our own personal stories. We are more than just tour guides, we are storytellers. I truly believe that the more I can connect myself to UCSB, the more powerful my tour will be. What are some aspects of being a tour guide that took you by surprise? Walking backwards is not as hard as I originally thought. Eventually you get the hang of it and no longer fear falling or tripping (for some of us at least). I never realized how much I didn’t know about UCSB until I became a tour guide and was given the opportunity to learn much more about what UCSB has to offer. I didn’t realize how impactful a position being a tour guide would be. Over time, I have learned that when I am giving a tour, it isn’t so important that I am there giving the tour as it is that these guests are there taking the tour. They are choosing to put their trust in you to give them an informational and engaging tour while at the same time seeking to gain insight in what it is like to pursue a higher education. For this, I take being a tour guide very seriously. I realize that when I give a tour, especially to groups of students from marginalized communities, my tour could be their first experience with what college is like and when I end by telling them “Whether or not UCSB is the place for you, just choosing to pursue a higher education is the first step to empowering yourself and bettering the world around you,” I could very well be the first person to have ever encouraged and believed in their ability to succeed at a four-year university. Being a tour guide is much more than getting paid to walk backwards. What is the strangest thing that happened while giving a tour? Strangest question asked by a student or parent? The strangest thing to ever happen to me during a tour has got to be when I encountered a detour (due to construction) by the engineering buildings and lowkey got lost for a minute on my way to the library. However, I just played it off like it was all intentional and joked that ‘UC’ stood for “under construction.